Mix first 8 ingredients until well blended; shape into 24 balls, using about 2 Tbsp for each. Heat oil in large nonstick skillet on medium heat. Add meatballs; cook 5 to 6 min. or until evenly browned, turning occasionally. 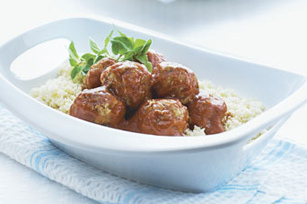 Add sauce; simmer on medium-low heat 10 to 15 min or until meatballs are done (160ºF).